Rpt Pattern Row until 19 rows have been worked in all or work measures approx 6.5 inches from beginning. Fasten off. First Front - With 5.00mm hook make 16ch, change to 4.00mm hook, work from # to # from back. Turn. (3 groups) Work Pattern Row until 16 rows have been worked in all or work measures 5.5 inches from beginning. Turn. dc, turn leaving remaining stitches unworked. Next row - ss to centre tr of next group, 3ch work Pattern Row to end. Turn. Work Pattern Row once. Fasten off. Second front - Work same as first front until 16 rows have been worked. Turn. Next Row - Miss 6st, re-join yarn to next tr, work Pattern Row to end. Next Row - Work Pattern Row to last dc, group and 3ch to turn, 1tr into last dc, turn leaving remaining stitches un-worked. Starting with 3ch, continue in tr stitch increasing 1 stitch at each end of every row by working 1tr into base of 3ch on beginning of row and 2tr into top of 3ch at the end of the row until 32tr + 3ch remain and 6 rows in all have been worked from beginning. Fasten off. edge and turning at the end of each row, re-join yarn to first stitch with a ss, work 3ch, miss 1ch, (1tr, 1ch, 1tr, 1ch, 1tr) into next ch, * miss 1ch, 1dc into next ch, miss 1ch, (1tr, 1ch, 1tr, 1ch, 1tr) into next ch, * rpt from * to * to last 4ch, miss 1ch, 1dc into next ch, miss 1ch, 1tr into last ch. Turn. (5 groups). Rpt Pattern Row twice more for cuff. Fasten off. Join shoulder seams, fold sleeves in half lengthways, then placing folds to shoulder seams ss or over sew with needle and yarn the sleeves into position. Join side and sleeve seams (leaving cuffs un-joined). Turn through to RS, join cuffs and fold onto RS of sleeves. edge to corner, 3dc into corner, 31dc evenly down left front, 3dc into corner, 1dc into ch along bottom of coat (cast on edge), 1dc into base of 1ch on beginning of row, ss to first dc. Turn. Starting with 1ch, 1dc into base of 1ch, work one more row of 1dc into each dc and 2ch space all around coat, working 3dc into all corners. Fasten off. Finishing - Sew in and tie off loose ends of yarn, attach buttons to correspond with buttonholes. Pattern Row 1 - 3ch, * 1dc into centre tr of group, (1tr, 1ch, 1tr, 1ch, 1tr) into next dc, * rpt from * to * to end, (1tr, 1ch) into base of 3ch, ss to top of 3ch on beginning of row. Turn. Pattern Row 2 - 1ch, 1dc into base of 1ch, * (1tr, 1ch, 1tr, 1ch, 1tr) into next dc, 1dc into centre tr of group, * rpt from * to * to last dc, (1tr, 1ch, 1tr, 1ch, 1tr) into last dc, ss to first dc on beginning of row. Turn. Rpt Pattern Rows 1 & 2 until 14 rows have been worked in all or work measures approx 4.5 inches from beginning. Fasten off. Using a length of yarn, thread through alternate stitches along cast on edge, pull both sides of yarn to gather and secure. Fasten off. Finishing - Sew in and tie off loose ends of yarn, attach pom-pom to gathered crown on hat. 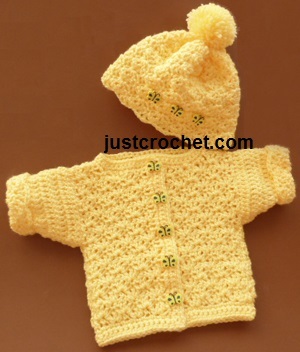 Hope you enjoy this free crochet pattern for a preemie cardi and hat.